The earth is filled with God’s unfailing love, and there is a thin space each time we reach out to another with His unfailing love. We are so much closer to God when we are expressing His love to the world. We have many reasons to praise the Lord today especially for His unfailing love which surrounds us. 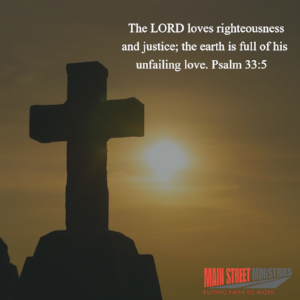 We can praise Him for His ways are straight and right in a crooked world. The world tries to defeat God’s unfailing love through hate, but His love is still alive through us. Therefore, it is imperative as believers to be constant in our love for others. Hate doesn’t stand a chance when His love is prevailing. Love is a source of power which is more potent than any source ever created. If we could channel this love and pour it out over the world, there could be an incredible awakening. This source of power is unfailing so why would we desire any other authority than what God can give?